You can use the Microsoft Excel reports to display information from the data warehouse for your team project. This topic describes reports that are provided with the process template for MSF for Agile Software Development v5.0. If your team project portal is based on Microsoft Office SharePoint Server 2007 Enterprise Edition or Microsoft SharePoint Server 2010 Enterprise Edition, you can view these reports in your team project's dashboards. 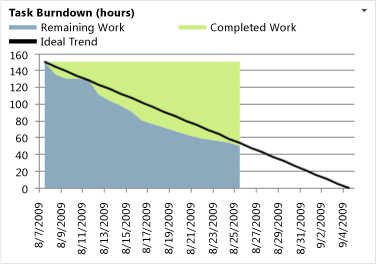 For more information, see Dashboards (Agile). If the project collection where your team project is stored is provisioned with SQL Server Reporting Services, you can use Report Manager to view and filter the same information that the Excel reports provide. For more information, see Reports (Agile). You can access the Microsoft Excel reports from the Documents folder, as the following illustration shows. To view or modify an Excel report that is stored under the Documents node for a team project, you must be assigned or belong to a group that has been assigned Read permissions for Team Foundation. You must also have Visitors or Members permissions, respectively, in SharePoint Products for the team project. In addition, all Microsoft Excel reports that appear in the enterprise dashboards contain data from the Analysis Services cube. You can view enterprise dashboards only if the team project portal is hosted on a server that is running Microsoft Office SharePoint Server 2007 Enterprise Edition or Microsoft SharePoint Server 2010 Enterprise Edition. To view, refresh, or create an Excel report from an enterprise dashboard, you must configure the SharePoint web application definition to either use Single Sign-On or Windows Authentication. The following restrictions apply based on the authentication service that you configure. You must configure the SharePoint web application for Single Sign-On if you do not want to add users as members of the TfsWarehouseDataReaders security role in SQL Server Analysis Services. In addition, you must configure the application for Single Sign-on if the team project portal is configured to use NTLM authentication and is not installed on the data-tier server. You must configure the SharePoint web application to use Single Sign-on. For more information about how to configure Single Sign-on, see Configure Settings for Dashboard Compatibility. You must add dashboard viewers to a group that is granted access to the Single Sign-on enterprise application definition. You must either host the team project portal on the data-tier server, or you must configure the SharePoint web application to use Kerberos authentication. You must add users as members of the TfsWarehouseDataReaders security role in SQL Server Analysis Services. The following table summarizes the required permissions based on activity. For information about how to grant these permissions to team members, see Add Users to Team Projects and Grant Access to the Databases of the Data Warehouse for Visual Studio ALM. 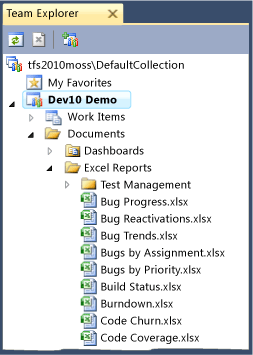 For information about permissions that are required to work with Excel reports in general, see Assigning Permissions to View and Manage Reports for Visual Studio ALM. To access the Documents node for a team project, you must be a member of the Team Foundation Valid Users security group. If the required security permissions are set explicitly, your View project-level information permission on the team project must be set to Allow. In addition to Visitors or Read permissions, you must belong to a group that is granted access to the the TfsWarehouseDataReader role or to the Single Sign-on enterprise application definition for the SharePoint web application. In addition to these permissions, you may need permission to open a team query. For more information, see Organize and Set Permissions on Work Item Queries. Also, if you want to save the resulting workbook to the project portal, you belong to the Members group for the portal. The New Excel Report button is available only if reporting is configured for the project collection that hosts the team project. If you want to save the resulting workbook to the project portal, you must belong to the Members group for the portal. To save files under the Documents node, you must be a must belong to the Members group for the team project portal. For more information, see Managing Documents and Document Libraries. To access an Microsoft Excel report, your team project must have been provisioned with a project portal. Microsoft Excel reports are stored on the server that hosts SharePoint Products for your team project. If a project portal has not been enabled for your team project, you cannot access the workbook. For more information, see Access a Team Project Portal and Process Guidance. Team members can use the reports in the following table to help track the rate of the team's progress toward completing Tasks, implementing User Stories, and meeting their iteration plan. A visual representation of the cumulative count of all hours for all tasks for the past four weeks. 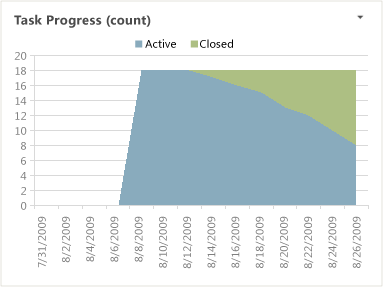 A visual representation of the cumulative count of all active and closed tasks for the past four weeks. A visual representation of the cumulative count of all user stories, grouped by their state, for the past four weeks. 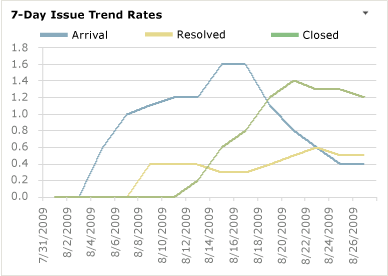 Line chart that shows the rolling average of the number of issues that the team has opened and closed for the past four weeks. The rolling average is based on the seven days before the date for which it is calculated. 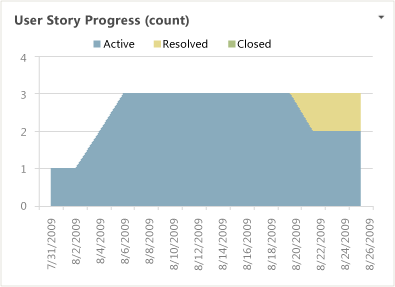 Team members can use the reports in the following table to help track the bugs that the team finds and the progress that the team makes toward fixing them. These reports appear in the Bugs dashboard. For more information, see Bugs Dashboard. A visual representation of the cumulative count of all bugs, grouped by their state for the past four weeks. 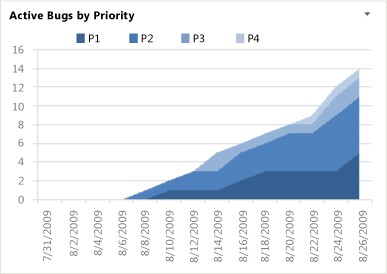 A visual representation of the cumulative count of all bugs, grouped by their priority for the past four weeks. 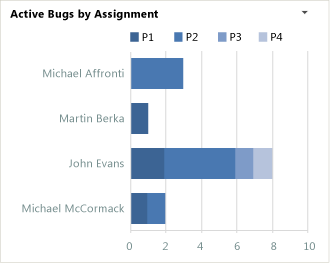 A horizontal bar chart with the total count of Bugs that each team member has currently assigned to them in the active state, grouped by priority. 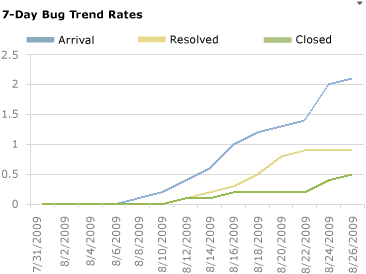 A stacked area graph of the number of bugs that have been reactivated from the resolved or closed state within the past four weeks. 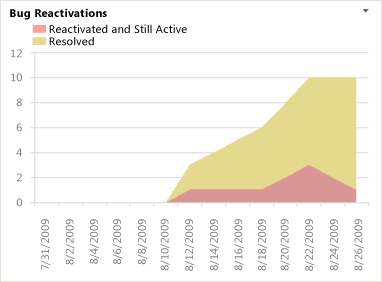 The Bug Reactivations report appears on the Quality dashboard. 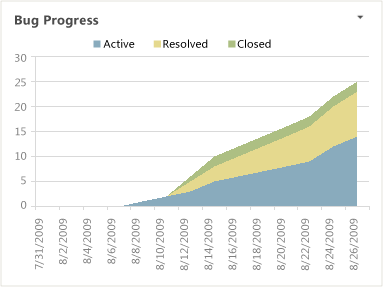 For more information, see Quality Dashboard (Agile). Team members can use the reports in the following table to help track how source files are changing over time and how well the source code is being tested over time. These reports appear in the Build dashboard. For more information, see Build Dashboard (Agile). 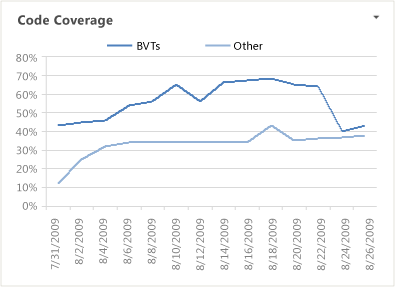 Line chart that depicts the percentage of code that was tested under Build Verification Test over the last four weeks. 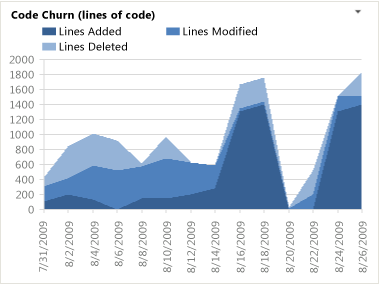 Stacked area chart that depicts the number of lines of code that the team added, removed, and changed in the checkins before the build within the last four weeks. Stacked column that shows the count of builds that Failed or Succeeded within the last four weeks. The Builds Status report appears on the Quality dashboard. For more information, see Quality Dashboard (Agile). Team members can use the reports in the following table to help monitor test activities, report on progress, find gaps in test coverage, and identify test areas that may require further investigation. These reports appear in the Test dashboard. For more information, see Test Dashboard (Agile). 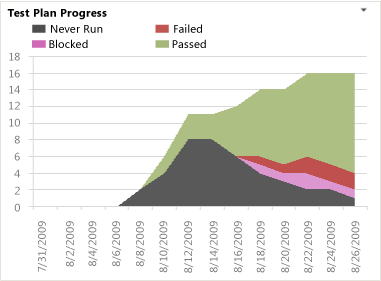 Stacked area graph of the test results grouped into their last recorded outcome - Never Run, Blocked, Failed, or Passed - within the past four weeks. 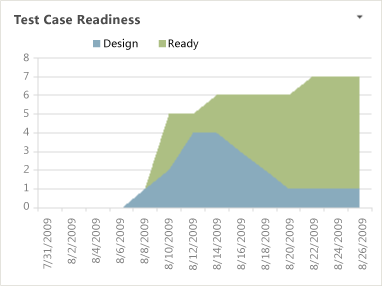 Stacked area graph that shows how many test cases are in the Design or Ready state for the past four weeks. 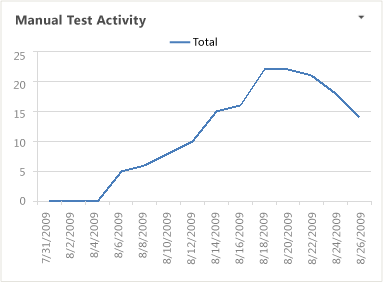 Horizontal bar chart that shows the count of test results for each test case and test configuration combination that is defined for each user story. 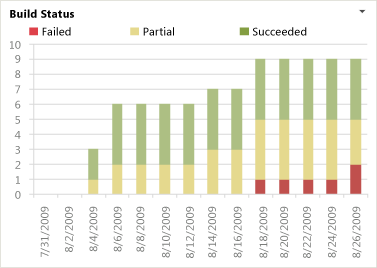 The chart groups the test results according to their most recent test run, where the options are Passed (green), Failed (red), Blocked (purple), or Not Run (gray). Line chart that shows the cumulative count of all results run for manual tests during the past four weeks. 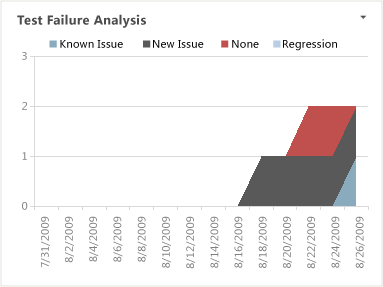 Stacked area graph that shows the cumulative count of all failed outcome results for tests, according to their failure type of Regression, New Issue, or Known Issue, during the past four weeks. Team members can use the reports in the following table to obtain an overview of progress occurring in the test, development, and build areas. These reports appear in the Quality dashboard. For more information, see Quality Dashboard (Agile). A stacked area graph of the cumulative count of all Bugs, grouped by their state for the past four weeks.